One of the biggest questions in technological fields today is how to use all of the data that is now readily available to implement practical solutions to pressing problems. Anuj Sharma, Co-Director of REACTOR lab, has been utilizing the cutting-edge technology of deep learning to revolutionize the use of cameras in traffic operations. Sharma, who also works as a research scientist at Iowa State’s Institute for Transportation and its Center for Transportation Research and Education, presented a case study from his research at a Transportation Research Board workshop in January to help others make use deep learning based image processing in their work as well. Deep learning uses neural networks capable of mirroring parts of the human brain that can learn from data without direction. Sharma’s case study “Application of Deep Learning for Advancing the Use of Cameras as a Sensor” was on how to leverage recent developments in high performance computing and advanced machine learning algorithms to maximize the use of data streaming from closed-circuit television (CCTV) cameras. Pan-Tilt-Zoom capable CCTV cameras are used widely by Departments of Transportation and other transportation agencies for doing manual condition assessment in case of traffic incidents or inclement weather conditions. Sharma’s research aims at converting this wealth of data into actionable information by automating the image processing and alerting the operator when the algorithm detects any anomaly. This will reduce the workload of operators who are tasked to monitor hundreds of cameras for detecting anything that looks out of the ordinary. In addition, the same cameras can be used for monitoring traffic volumes, traffic speeds, wet-icy road conditions, wrong way detection etc. thus eliminating the need for putting additional expensive sensors. In recent years, deep learning is being successfully used in the areas of speech recognition by mobile phones, image tagging, developing expert system to identify plant disease using images to name a few. Sharma hopes to transform the field of transportation by implementing this technology for roadway monitoring. He’s helping to foster that future sooner rather than later. As an organizing committee member of NVIDIA Corp.’s AI City Challenge, he’s helping with competitions aimed at accelerating the implementation of intelligent transportation systems. While Sharma has been presenting at TRB since 2004, he said the massive gathering is one of the best stages for sharing cutting-edge applications, like this one. 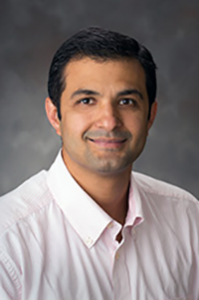 The “Big Data Applications and Methods in Transportation” workshop, where Sharma presented his findings, was held Sunday, January 7, 2018 and had over 200 attendees. Sharma was one of four presenters offering examples of how they’re using big data to move transportation research forward. Information from the workshop will be used in a workbook and shared through sponsoring committees.